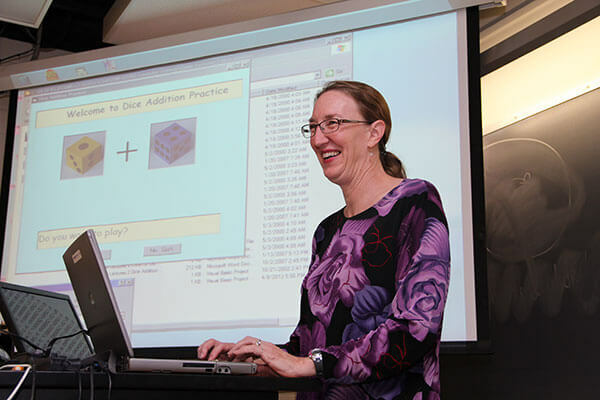 The Master of Science in Computer Science combines studies in the mathematical and theoretical foundations of computing with hands-on, practical scientific research. A Computer Science master’s degree prepares graduates to write software and work with operating systems and architecture. It is a hands-on way to learn computing skills and will prepare you to understand algorithms, software architecture, design patterns, data structures and coding techniques. Students are expected to be able to write computer programs in a high-level programming language and to understand the connection between computer hardware and software before starting the degree program. Two courses are taken from the Engineering Department. The Master of Science in Computer Science is sometimes offered off-campus at various locations, and some courses are offered in a hybrid or online format. Earn both a Bachelor’s and a Master’s in Computer Science in as little as five years. An intensive course of study, undergraduate students can begin graduate course work during their senior year. Earn both a Master’s in Computer Science and a Juris Doctorate law degree. – Malak Abouhenidi, (M.S. ’14) — Read her story. Computer scientists are in high demand in organizations that develop or use software. Most companies have information technology (IT) departments or at least an IT expert on staff. Applicants should have taken programming classes including data structures and object-oriented programming.